We have all you need to find the right kid’s shoe sizes for any age – be it for Small Kids (Babies, Toddlers) or Big Kids (Children and Youth). Use our easy guide to measure feet and then convert into US size or international childrens shoe sizes like UK, Euro, Mexican or Asian. Remember: Kid’s feet can grow extremely fast at up to an inch a year (this equals two shoe sizes!). Shoes that don’t fit correctly can cause irreversible damage to children’s feet. Take your time when buying shoes. Have feet measured and use this trick to check if shoes are a perfect fit. I’m a little lost as far as kids shoe sizes go — How do they work? How do Kids Shoe Sizes work? Shoe sizes for kids differs greatly from adult shoe sizes. First of all, there is no differentiation in gender, meaning that boys and girls use the same size (unlike women’s and men’s sizes which differ greatly). The shoe size system for children differs greatly from adult sizes. There is no differentiation in gender, meaning that boys and girls use the same. But kid’s shoe sizes are divided into three age groups: Small Kids, Big Kids and Youth. 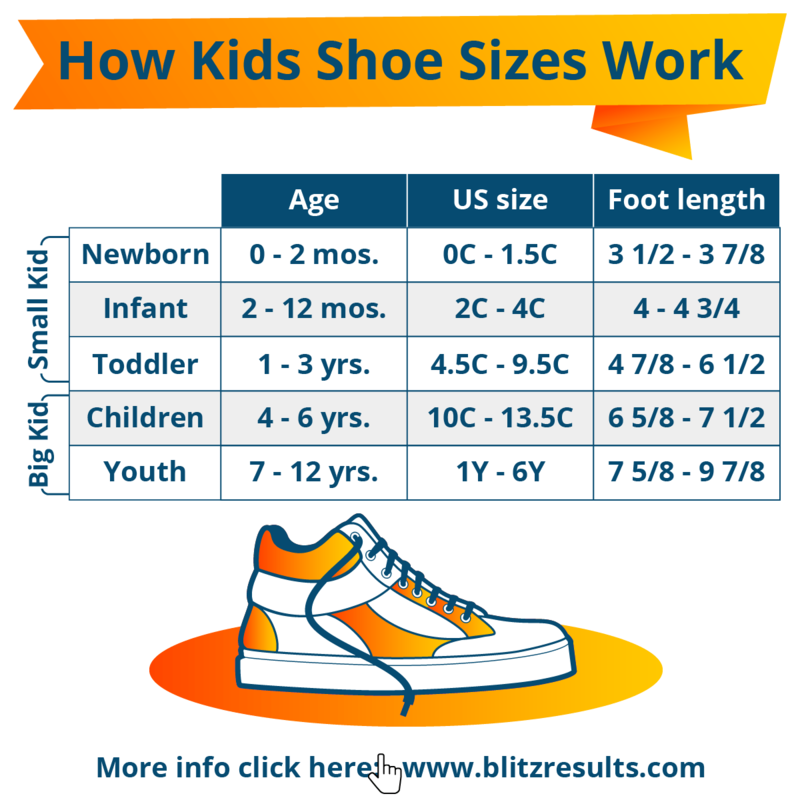 Use this kids shoe size chart to find the right sizes for kids from newborn to 12 years of age. Not sure about the inch length of your kids’ foot? Use this measurement guide or printable sizing chart. How to Read a Kids Shoe Size Chart? It’s easy to find perfect fitting shoes by using a size guide. Read a conversion chart like this: Select the column with the size you already know. Then move horizontally in the same line to find the size you are looking for. If in doubt, or between sizes, opt for the bigger one! 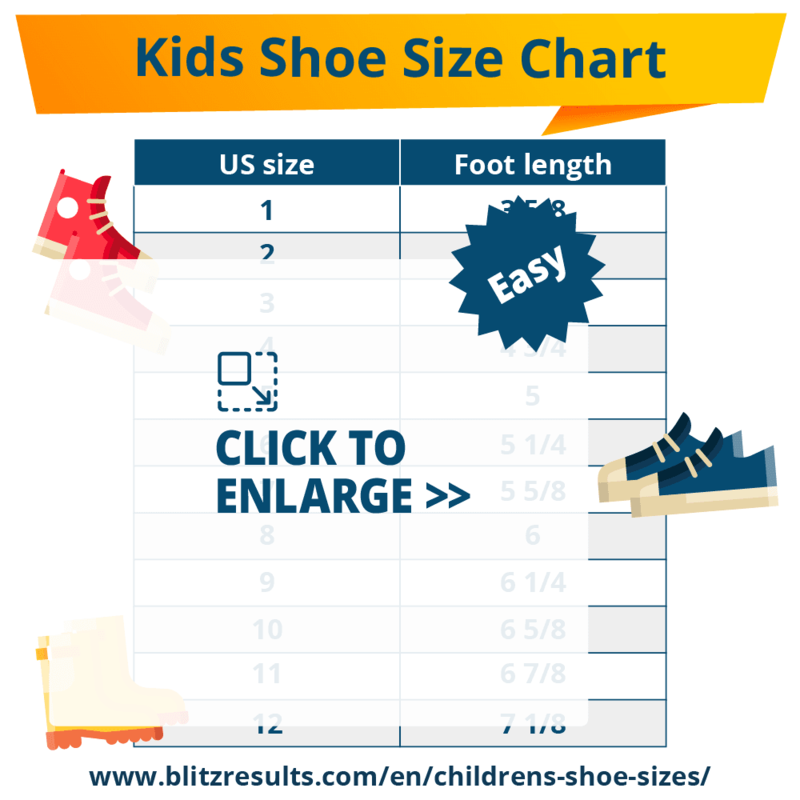 Read a kids shoe size chart like this: Select the column with the size you know and move horizontally in the same line to find the size you are looking for. Babies usually start walking from 10 to 18 months. Indoors, shoes are unnecessary. Instead, let them walk barefoot or in non-slip socks – this helps strengthen the developing muscles. Outdoors, however, babies’ feet should be protected with flexible, lightweight shoes, preferably of a natural and breathable mix of materials like cotton/wool and leather. Have your child’s feet professionally measured regularly, as feet grow very fast in the first one and half years. Remember: poorly fitting shoes can cause irreversible damage. 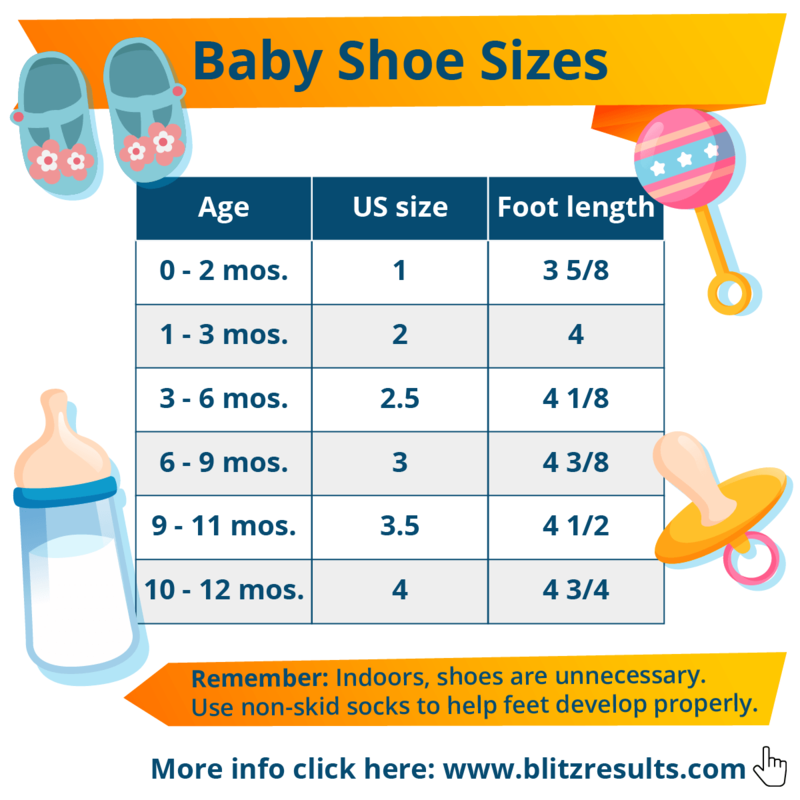 Check below chart for baby shoe size by age and foot length. Looking for toddler shoe sizes? Use this conversion chart for toddlers between one and three years of age. 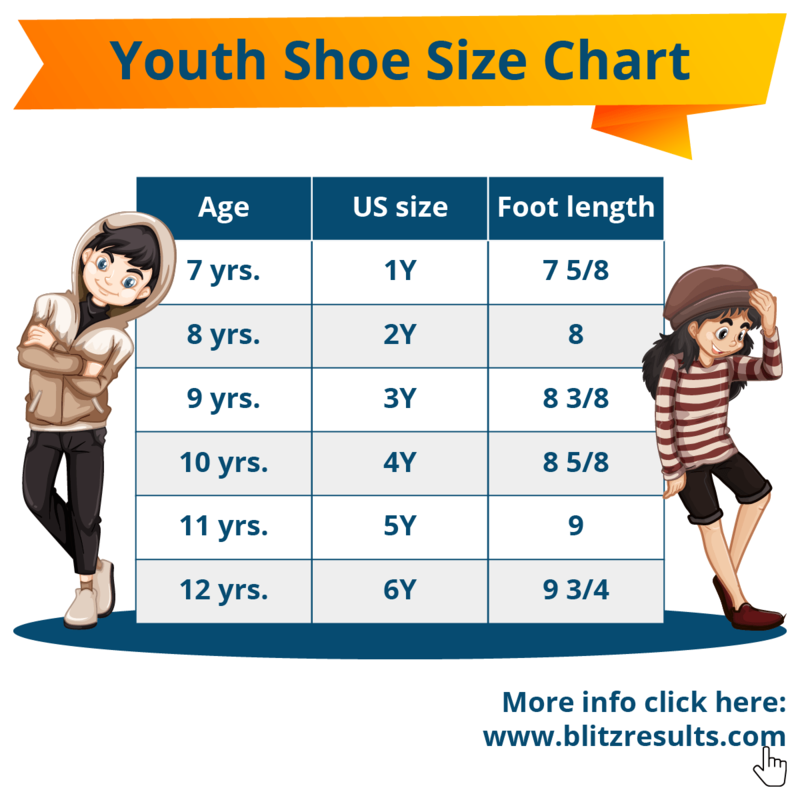 Shoe sizes for big kids and youths between seven and 12 years of age. Check out adult sizes if feet are bigger than 8.5” (girls) or 9.5” (boys). The growth of children’s feet is not only very individual, but also very rapid. Children’s feet, especially infants and toddlers, can grow up to one inch a year! Prefabricated shoe size charts, don’t necessarily match the development curve of your child’s feet. It is better to measured the size of the feet and then convert ᐅ Babies ᐅ Kids ᐅ Teens, rather than to rely on an average shoe size by age chart. 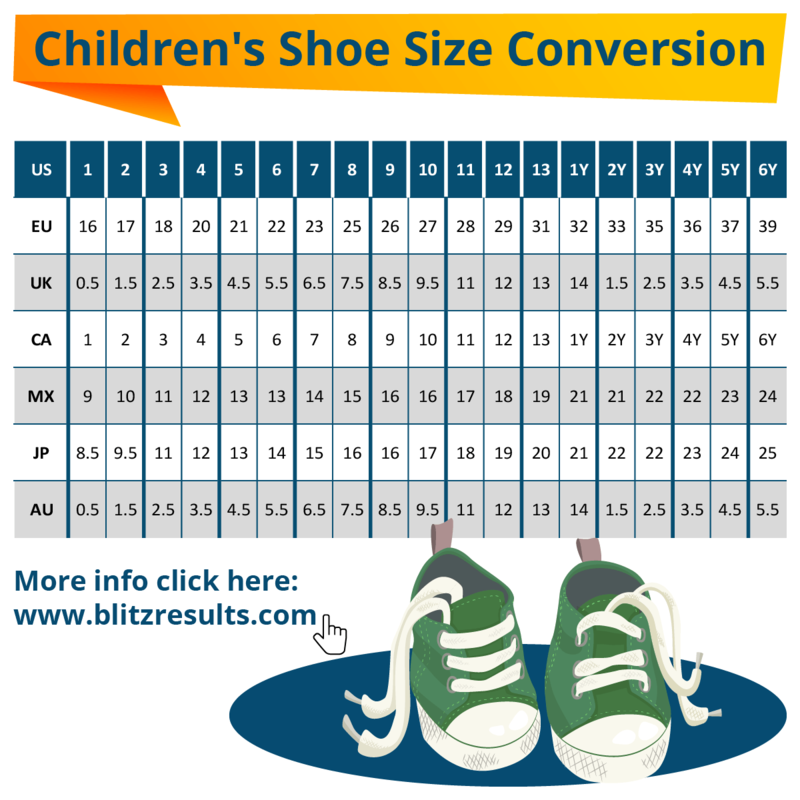 Use data from kids shoe size chart by age only as an approximate! The growth phases for boys usually extend up to 15 years, while in girls they are often completed by the age of 13. 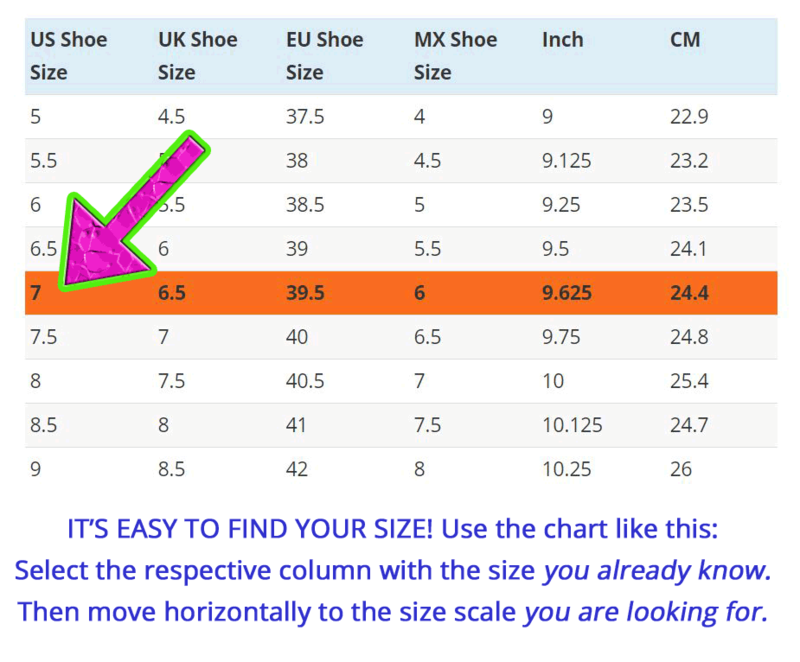 See this chart for all international sizes, including conversion from measurments in feet/centimeters to international sizing. EU/EURO/European sizes equal to Italian, German and French shoe sizes! Shopping overseas or buying an international brand? Use this conversion chart to find international sizes: Convert US-sizes to Euro-, English, Mexican or Asian sizes – or even from one international size to the other, like UK-Europe. Measure feet in the afternoon, as they will become wider and longer during the day. Your child should be standing, instead of sitting, during measurements, as this also affects the size of their feet. To measure: place the foot on a tape measure and measure it from the heel to the tip of the longest toe. This measurement is your child’s shoe size. 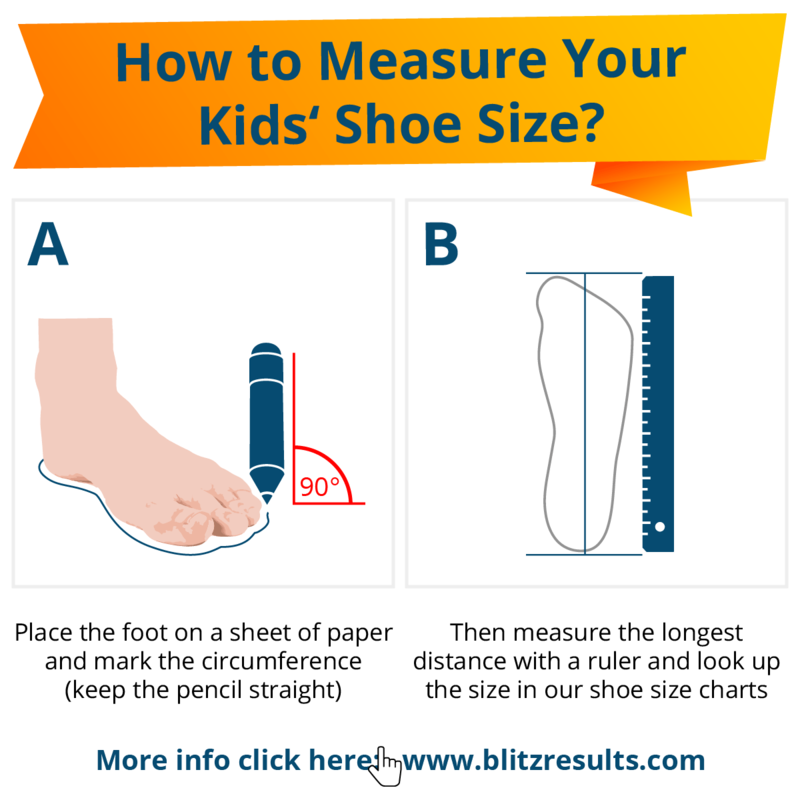 How to Measure Your Kids’ Shoe Size? Place the foot on a sheet of paper and mark the circumference (keep the pencil straight). Then measure the longest distance with a ruler an look ip the size in our shoe size chart. Always measure both feet! Differences of half an inch in length are quite common. Half an inch corresponds to a whole shoe size and must be taken into consideration when buying! Be it renown brands like Nike, Stride-rite, Crocs, Plae or Geox – sizes vary slightly from brand to brand. Some run smaller, other run larger. Use shoe sizes and inches only as an approximate, especially for smaller kids. Check for measurements every two months – because children’s feet grow incredibly fast! Want to find out the right size without measuring tape or ruler? 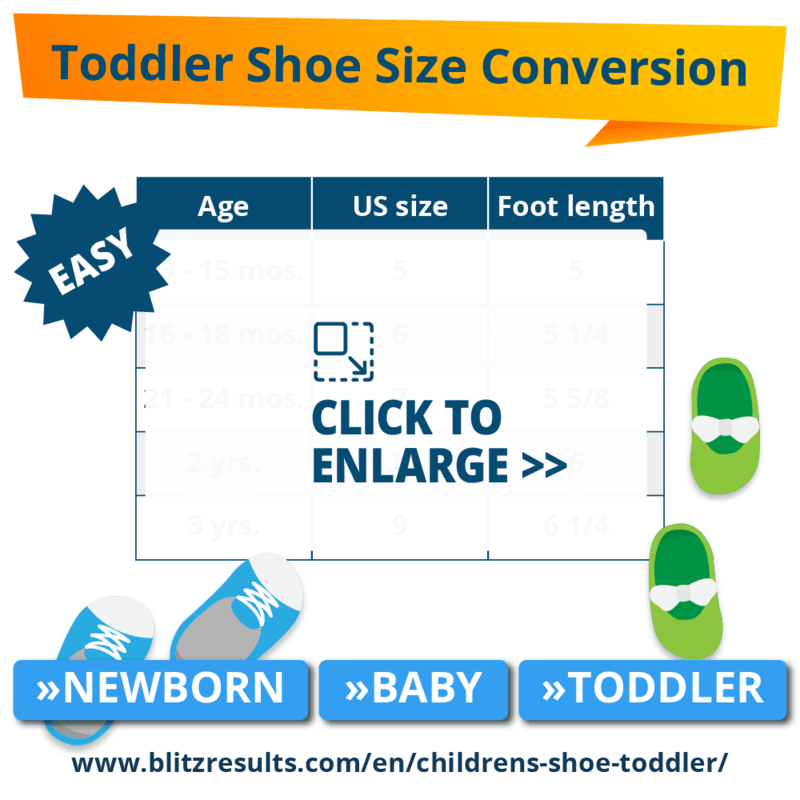 Download this handy children’s shoe size print-out/sizing guide. How do you Know if a Shoe Fits Properly? Wrong: Most parents solely rely on the “thumb test”. The thumb presses on the toe of the shoe to see how much room there is to grow. The problem: Children often retract their toes by reflex, so the foot is rolled under. It may seem like there’s enough room, although, in reality, the shoes are too small. Better: Place hand on front of the shoe, so that the child can’t draw the toes up. Then, with the other hand, check the space at the heel. This way you can feel whether there is enough room to grow. How do you know if a shoe fits properly? Not good: Pressing thumb on the shoe to see how much room there is. 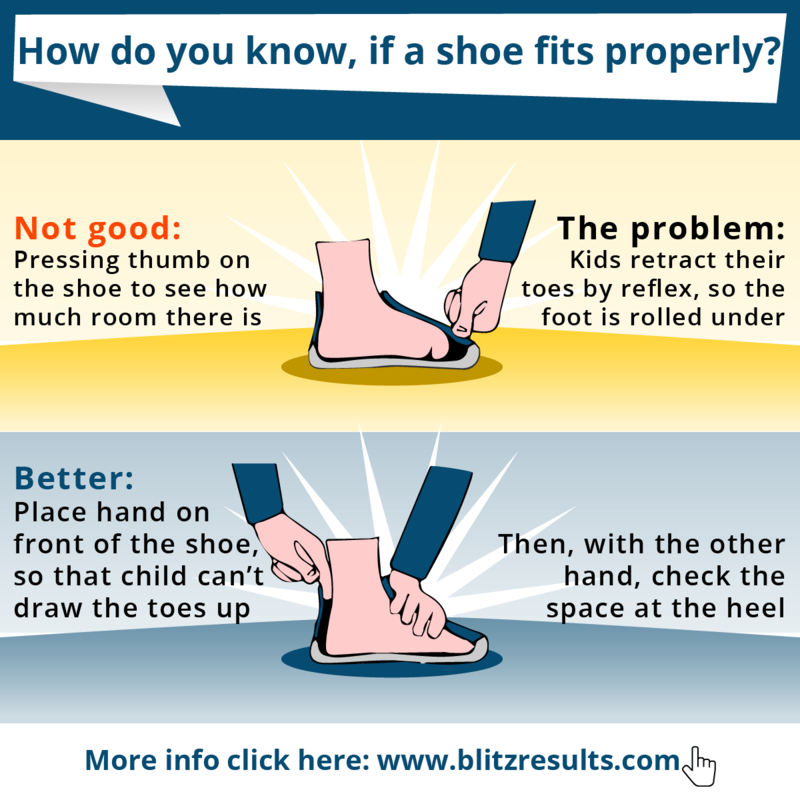 The problem: Kids retract their toes by reflex, so the foot is rolled under. Better: place hand on front of the shoe so that child can’t draw the toes up. Then, with the other hand, check the space at the heel. 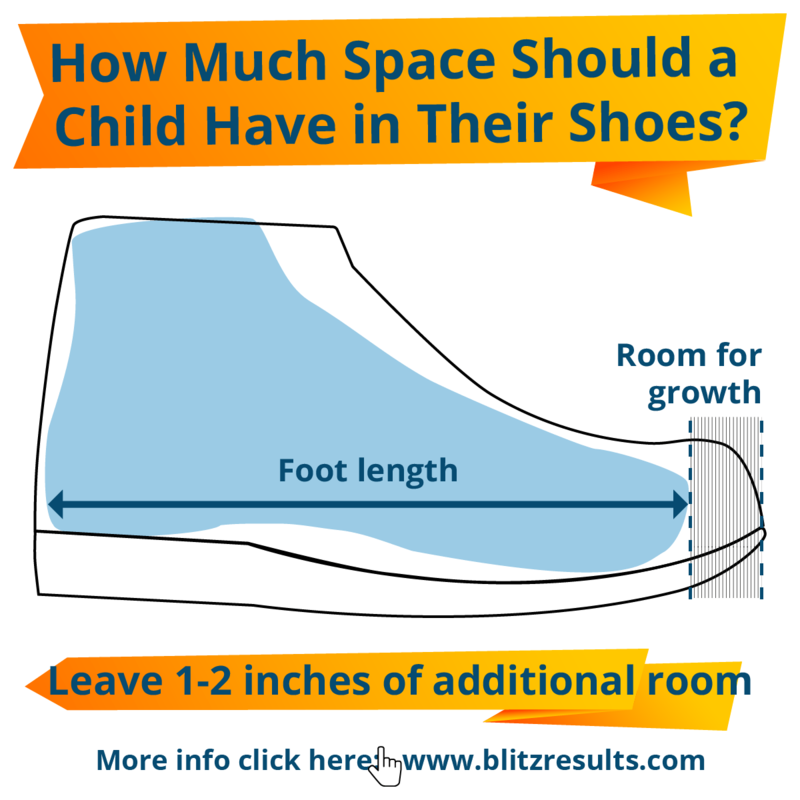 How Much Space Should a Child Have in Their Shoes? Children’s shoes should fit well. Most parents act in an exemplary manner when buying children’s shoes and especially look for enough “wiggle room” for the toes in the shoe. But did you know, however, that at least 0.5 – 0.7 inches (12 to 17 millimeters) should be added to foot length? That is how much space your child’s foot needs to be able to roll in the shoe while walking and running around. Childrens’ shoes should have 1 – 2 inches of additional room for growth. If you think that shoe size information is always right, think again. There are no mandatory standardizations for shoe sizes and this leads to significant deviations of up to 1.5 numbers. 91 percent of the shoe sizes indicated are smaller than the internal length of the shoe. Therefore, parents cannot rely on the shoe sizes and must, instead, take measurements themselves. Even if the shoe looks sweet and is the correct size according to the manufacturer, it does not mean that the shoe is the right choice for your child. Shoes that are too small put children at risk of foot deformities and other serious health issues. The bad news for parents; almost two-thirds of all children are wearing shoes that are too small! 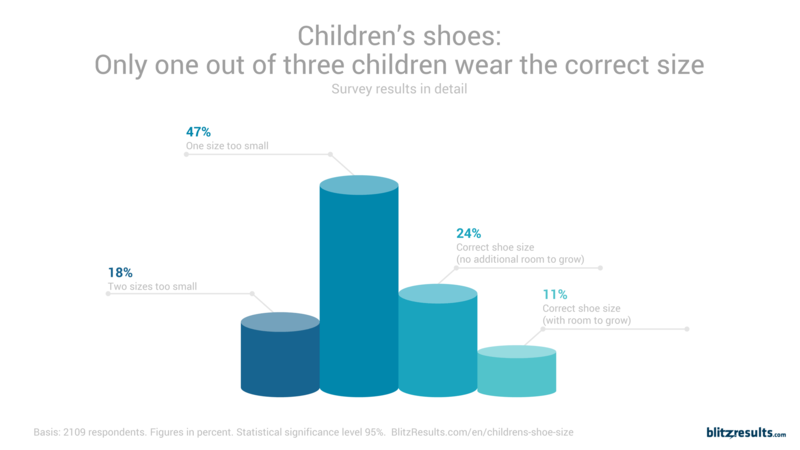 BlitzResults conducted a survey and found that 65% of all little kids are wearing shoes that are too small. Of these, 47% are one size too small and 18% are even two. Only 35% are wearing the correct size and only 11% of those have “room to grow”. Many parents hold the shoe sole up to the child’s foot to estimate the size. But the length on the inside of the shoe can’t be estimated from the outside and is often much shorter than you’d expect (lining, seams, footbed). 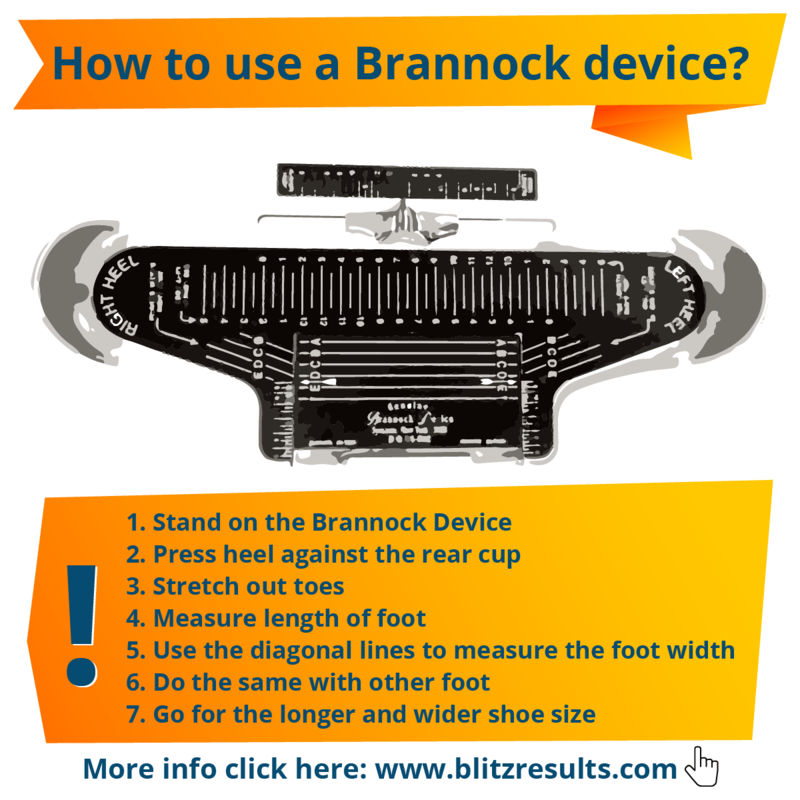 It’s far better to use an appropriate measuring instrument like the Brannock Device. Charles F. Brannock developed a measurement tool to get the length, width, and arch length of the human foot easily. The Brannock Device has a left and right heel cup to measure both feet. Since its invention, the Brannock Device is an international standard of the footwear industry and used in every good shoe shop. If there are no specialist shops in your area and you prefer to buy online, an investment in a Brannock Device and inner shoe measuring instrument might be a good alternative. Price for Brannock Devices start at 25 USD (used, on ebay or craigslist) or new at 60 USD. Stand on the Brannock Device. Press heel firmly against the rear cup. Stretch out toes and measure length of foot. Use the diagonal width line to measure the width of the foot. Repeat procedure with other foot and go for the longer/wider shoe size. When should babies start wearing shoes? What shoes are best for first walkers? It is only when your child takes their first steps outside that you will need to deal with purchasing shoes. In order to provide enough space for the rolling of the foot, the shoes on the inside should be half an inch to 3/4 inch longer than the foot. The shoes should be flexible and have good air circulation. What size feet do 5 year old’s have? Kids feet grow rapidly (up to an inch a year – which equals two shoe sizes!). And growth is very individual. Prefabricated shoe size chart kids, don’t necessarily match the development curve of your child’s feet! However, most five year old boys wear shoe sizes between 11.5 and 13, girls between 11 and 12.5. What are youth shoe sizes? The shoe size system for youth differs greatly from adult sizes. For example, there is no differentiation in gender, meaning that boys and girls use the same size. Youth sizes are anything between size 1Y and 6Y (usually between 7 and 12 years). What is the difference between youth and adult shoe sizes? Adult sizes start at 8.5” for girls (US size 5) and 9.5” for boys (US size 6.5). As you can see, adult sizes differentiate between gender – and youth sizes don’t. Keep in mind that kids shoes are generally cheaper than adults. Moneywise it could be a good idea to stick to children’s sizes as long as possible. Are boys and girls shoe sizes the same? Yes, boys and girls shoes are the same! Unlike with adult sizes, there is no seperate boys shoe size chart. The concern here is that by wearing poorly fitting shoes, kids can develop foot deformities like “hallux valgus”. If this type of condition sounds like something that would be a rare occurrence, think again. According to the National Health Institute, 30 percent of kids have foot deformities that are irreversible. The American Academy of Pediatrics recommends shoes that are neither too big nor too small. Likewise, stiff or airtight shoes are very bad for children’s foot development. Children’s shoes should be made of soft material and allow the feet to breathe. Many podiatrists add that shoes should also have stiff heel (press on both sides of the heel counter, it shouldn’t collapse) and recommend shoes for toddlers with a rigid middle (shoe should never twist in the middle). Shoes should allow the foot to breathe: Only a footbed made of leather and natural materials is suitable for children’s shoes, because it allows for air circulation and can prevent sweating. Synthetic fabrics, on the other hand, make children’s feet sweat, which stands in the way of their foot health. Healthy foot development needs, not only, freedom of movement, but also, adequate air circulation. If shopping for kids shoes, also watch out for brands that offer a wider toe box (more room to wiggle) and shoe tabs of various length to provide a better fit for varying instep or girth size. These are the most important features to look for in a child’s shoe. Yes, worn shoes are perfectly okay – provided that they are not worn out on one side or that the inner sole is severely deformed. Disinfection is recommended. Is it okay for children to wear rain boots all the time? Rubber boots for everyday life? No, absolutely not! Rubber boots should only be used when it is really wet outside. They are not suitable everyday shoes, as they usually make the feet sweat. The boots should be made of natural rubber rather than PVC. This is because both the manufacturing of PVC as well as the printed motifs can contain harmful pollutants which can be absorbed by your children’s feet. How much room should children have in a shoe? Your child’s neon-colored Nike sneakers and sparkly Stride Rite Mary Jane shoes may look snazzy — but do they actually fit? If your child’s shoes leave less than half an inch (12 mm) of space for the feet, it is time to buy new shoes. New shoes, on the other hand, should leave at least 3/4 inch (17 mm) of free space for the feet to move. 2 How do Kids Shoe Sizes work? 4 How to Read a Kids Shoe Size Chart? 12 How do you Know if a Shoe Fits Properly? 13 How Much Space Should a Child Have in Their Shoes? 16 How to use a Brannock Device? 18 When should babies start wearing shoes? 19 What shoes are best for first walkers? 20 What size feet do 5 year old’s have? 21 What are youth shoe sizes? 22 What is the difference between youth and adult shoe sizes? 23 Are boys and girls shoe sizes the same? 24 What are the best shoes for children? 25 Is it OK for kids to wear second hand shoes? 26 Is it okay for children to wear rain boots all the time? 27 How much room should children have in a shoe?